I have been making White Chocolate Dipped Gingersnaps ever since the recipe crossed my desk when I was food editor of the Tampa Bay Times in St. Petersburg, Fla. For 13 years at the paper, I produced (along with the Keeler Elves) an annual Christmas cookie edition filled with recipes from readers. This one made the Cookie Hall of Fame. It has become a favorite for various reason. No. 1 … look at the photo. This is the way they look every time I bake them. I have never had a cookie fail with this recipe, and I have had them with others. Even a regular cookie baker has a wipe-out now and then. Though, at this time of year, who has time for baking disasters? Not me. The cookie itself is loaded with ginger flavor. It doesn’t have the crisp snap like store-bought gingersnaps, but is a bit softer. The cookies are quite puffy as they come out of the oven and then flatten slightly as they cool. You could leave them like this and you will have a darn fine cookie. But darn fine isn’t always good enough. I want fantastic, and that’s where the dipping comes in. Cool cookies completely before starting the next step. Melt white chocolate morsels with a bit of shortening and start dipping away. Shake the cookies over the bowl to let any excess white chocolate drip off. Place them on wax or parchment paper. They will set up quickly in the fridge. After the white chocolate has dried, the cookies can be frozen. Just another reason why I like this recipe. Oh, and one more. Dipped Gingersnaps look gorgeous on the cookie platter. Preheat oven to 350 degrees. In a large bowl, combine sugar and oil; mix well. Add eggs, one at a time, beating well after each addition. Stir in molasses. Combine dry ingredients in separate bowl; gradually add to creamed mixture and mix well. Shape into ¾-inch balls and roll in sugar. Place 2 inches apart on ungreased or parchment-lined baking sheet and bake for 10 to 12 minutes. Remove from cookie sheet to cool. Melt chips or bark with shortening in microwavable bowl. Dip cookies halfway and place on waxed paper to harden. This is just one of dozens of recipes the Sunday Supper tastemakers developed for this week’s special #Cookielicious cookie exchange party. Join us for a special #Cookielicious Twitter chat at 7 p.m. ET Tuesday, Dec. 1. Follow the hashtag #Cookielicious for an hour of tips and talk about cookie baking. They certainly do look delicious on the platter and gingersnaps scream Christmas to me. 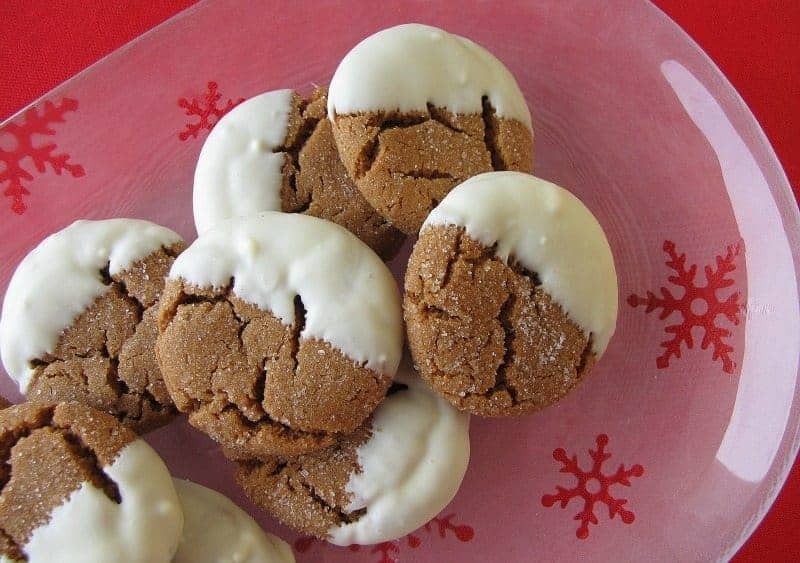 I’m going to start dipping my gingersnaps in white chocolate! YUM! Really elegant with the chocolate edges. Festive! Such beautiful cookies! I love the combination of the dipped chocolate with the the crinkles in the cookies. Love the white chocolate dip – looks like freshly fallen snow. These were too salty and there should be cloves as to give it more of a deep flavor. These were flavorless in my opinion! I’m sorry this flavor combo wasn’t to your liking, Merianne. Feel free to adjust the seasonings to your liking. You can add in a little ground clove if you prefer, but be careful as it is a very strong flavor and can very easily overpower the ginger/cinnamon. 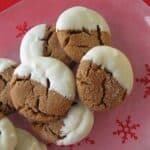 Additionally, although we feel the salt amount in this recipe is pretty standard what you need in a cookie recipe to magnify the other flavors for best results, please feel free to reduce the amount to your liking. Thanks so much for your feedback!